The Student Spaceflight Experiments Program would not be possible without the passion and unwavering dedication to our children of all the teachers and administrators in the SSEP communities, the Local Partner Organizations that embrace the spirit of community and the importance of education, and the individuals that step to the plate as quiet heroes serving as e.g., research advisors to the student teams, and on the community’s Step 1 Review Board. The National Center for Earth and Space Science Education can provide the programmatic framework, but SSEP’s ability to inspire and engage the next generation of scientists and engineers is firmly in the hands of all the educators, organizations, and individuals on the ground. 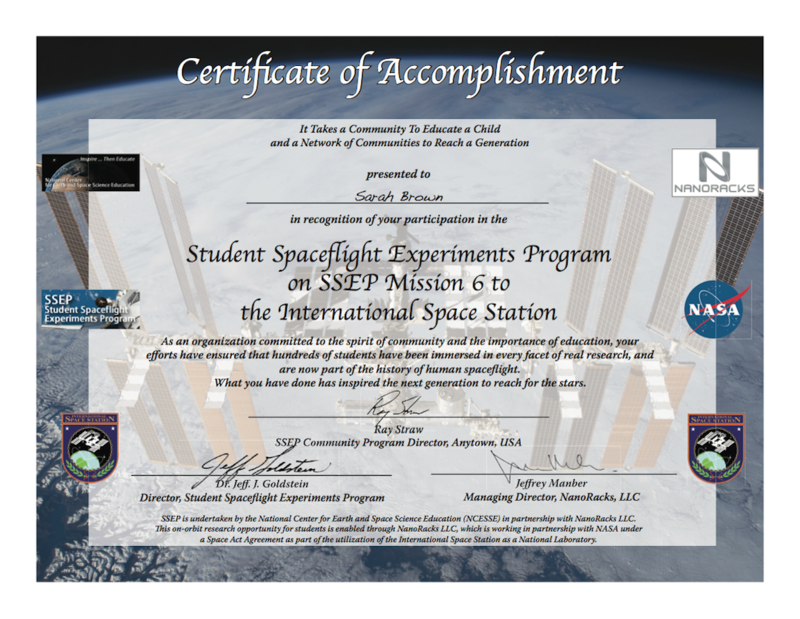 It is therefore with great pride that the Center, and its international arm, the Arthur C. Clarke Institute for Space Education, make available SSEP Mission 6 to ISS Certificates of Accomplishment for each of these groups. It is a special thank you to everyone that made SSEP possible for the thousands of students—we as a team—are inspiring to reach for the stars. Teaching … the eternal bond between young and old that is at its heart – joy. The certificates are provided to the Community Program Director as a PDF file. They are ready to be printed in color by the community, and given to teachers and administrators, local partner organizations, and individuals that have participated in the program. The certificates include imagery, logos, and ISS insignia, as well as electronic signatures for Dr. Jeff Goldstein, SSEP Director, and Jeffrey Manber, Managing Director of NanoRacks, LLC. The certificates are designed so that they can be customized to each community by including the name of the community and name of the community leader who will sign the certificates. The community leader may also provide an electronic signature to be incorporated in the certificate. An Important Note: NCESSE can only make certificate masters available to the SSEP Community Directors and Co-Directors in a community, or to some other designated community leader. 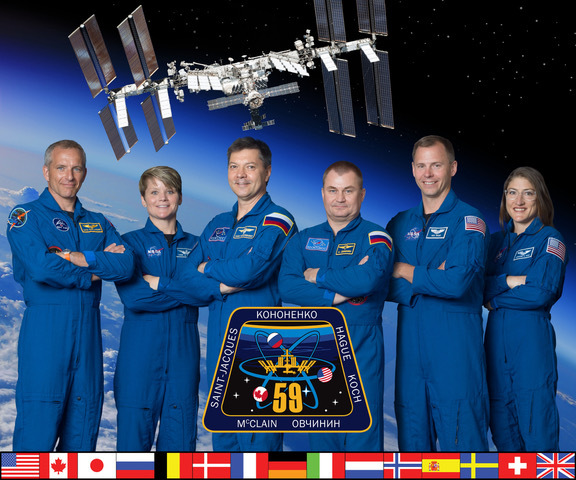 We have already sent word out to the Directors and Co-Directors for Mission 5 to ISS as to how they can obtain certificate masters for their community. The Smithsonian National Air and Space Museum, Center for the Advancement of Science in Space (CASIS), and Subaru of America, Inc. are National Partners on the Student Spaceflight Experiments Program.